I don’t know, maybe “conceited” is a harsh judgement, but I’ve just finished re-reading this book for the third time (not counting rounds of edits) and I wrote the darn thing! I can’t explain it, but I just love this book. I adore the characters, especially Naoto who to me, is so hot. The only other book in recent years that I’ve read three times is Dark Designs (Black Lace) by Madelynne Ellis because I simply adore one of the heroes of the menage, Takeshi. 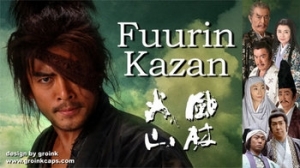 I’m still making my way through Fuurin Kazan, watching a couple of episodes here and there when I get a chance. It really is wonderful and Uchino Masaaki who plays Kansuke Yamamoto, the lead character reminds me so much of Toshiro Mifune, from his appearance and voice to the intensity of his acting. Surprisingly, however, I find that my favourite character actually is Takeda Harunobu, the head of the Takeda clan. He is turning out to be a most sympathetic character and the one who has had to face some of the most difficult choices and work the hardest to retain his basically good-hearted nature. As a young man he was only interested in art and poetry but his teacher insisted that he grow up and take his proper place in the lineage. His father was angry at him for being what he considered a fool but Harunobu proves himself as a warrior and leader and eventually deposes his father, banishing him from their province. Of course, the circumstances are complex and Harunobu’s actions appear completely understandable as he does so to save his province from constant war and famine due to his father’s ongoing war-mongering. The other news is that I will be going up to Georgia starting tomorrow morning and will be there for close to a week, so I probably won’t be able to update the blog until then. I hope you’ll bear with me!